I try to BJS editor for a new comer but have a simple question. How do I save & import project? I checked the following document, but can't save and import. The operation is true for saving project? For example, I opened the project with "Project/ Import Project". Click "No" on "Append to existing one?". Then, I selected the all scene files (bjs5.jpg). But scene did not change and keep showing "Loading scene" logo. 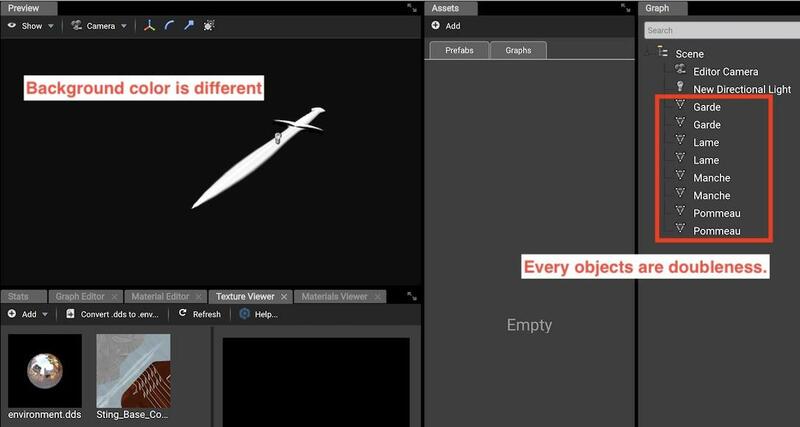 I opened the editor with online and operate the same. I got the following log with chrome developer tool. What should I do for import project? In this case, I'd like to open the default scene including the sword mesh I added by myself. I suggest that you always save your project (the .editorproject) using "Save Project..." in the same directory as your scene file, textures, etc. This folder will be your design/artist project that you'll, in future, export for developers (using "Export Template..."). 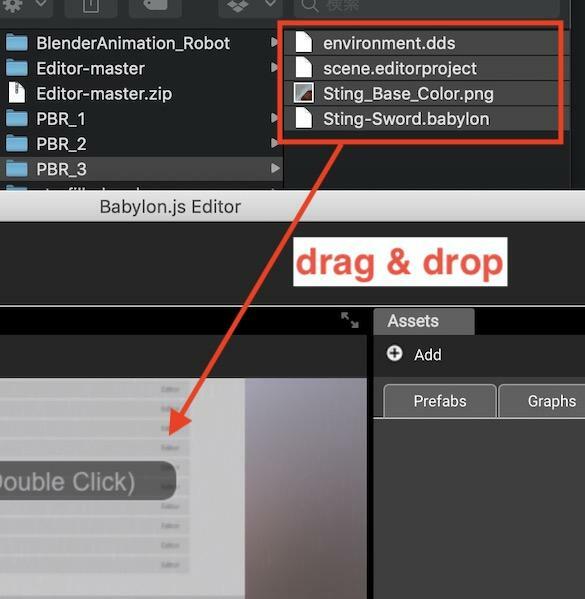 To reload your project, just drag'n'drop ALL your files including the .editorproject in the editor. Thanks again for your kindly answer. I finally understood I need to gather all files at the same folder. 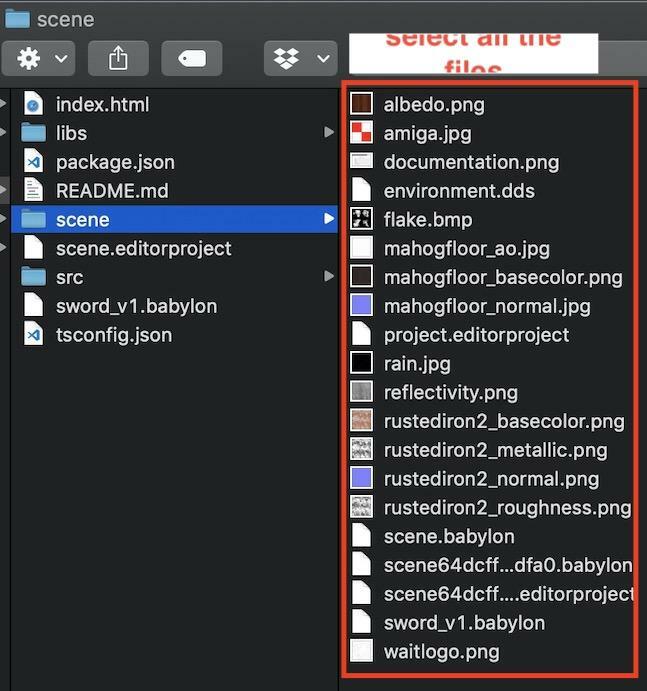 I misunderstood every files at different place can be recognized or copied because Unity copies all files in Unity's project folder. But I have new two questions when the following operation. Gathered all files at the same folder and made a scene (bjs6.jpg). Clicked "Save Project" and got "scene.editorproject". Restarted the editor and dragged & drop all the files (bjs7.jpg). Then it seems to works but all model objects are doubleness (bjs8.jpg). I couldn't know what kind of problem for the sword model or my operation. Any comment will helpful for me. I read the changed document of " https://github.com/BabylonJS/Documentation/pull/1318/files "
Thanks for it, I can understand the difference between "Save Project" and "Export templete". @Luaacro I installed the latest version of the Editor on "http://editor.babylonjs.com/﻿BabylonJS Editor.dmg", but situation is the same. My Mac (OS ver :10.14.1) may be something wrong. I checked it on my windows PC after back to Japan. Thanks! 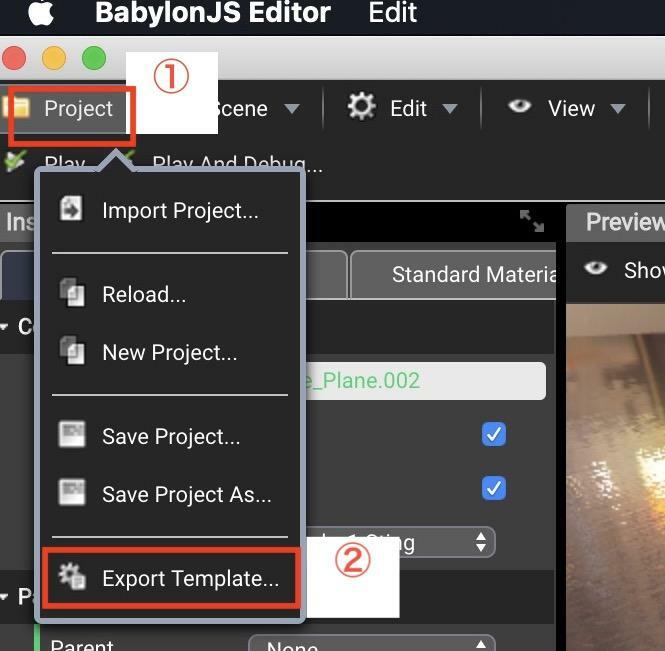 @Luaacro I installed the latest version of editor from "http://editor.babylonjs.com/﻿BabylonJS Editor.exe"But the situation was the same.The doubleness objects have the following feature. My Windows 10 version is Windows 10 Pro 1809. I'll try for other 3D model and investigate what caused the situation. If you find anything, I'd appreciate it. @Luaacro Deeply thanks for your investigation. Yes, it reproduce systematically as long as I tried. All files is in the following links. I'll improve the documentation about importing meshes to a project. Because, importing meshes means that it will be saved in the .editorproject. 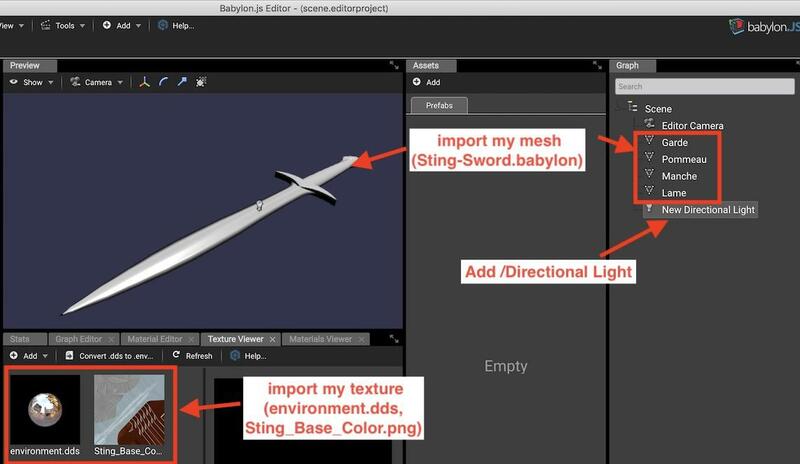 So if you load the .editorproject and the .babylon scene together you'll get meshes doubleness. @Luaacro Thanks! No duplicate error found when I erased the doubleness and save again. Please tell me f you improved the documentation. I updated my blog post about BJS. @Luaacro Thanks! I added another blog post about BJS editor. BJS itself is not so popular in Japan. I'll share the good points step by step. I'll waiting for your updated documentation!